The following foods and drinks will help to boost the immunity, supplement important nutrients. When getting sick, many of you are not fond of hard food. However, it is necessary to make sure that you drink a great amount of fluids. Ginger beer, ginger tea and mint tea should be considered if you suffer from trouble with the stomach. Beverages containing alkaline ionized water are extremely useful in case you have diarrhea. Types of fruit juices like apple cider vinegar, orange juice and grapefruit juice will provide nutrients and calories for your body. As a result, the dizzying sensation will quickly disappear. All kinds of hot tea help to keep your body warm and treat nasal congestion. Green tea, ginger tea, lemon tea and Oolong tea are rich in antioxidants and strengthen the immune system. When having the flu and the stuffy nose, you can drink these teas while they are still hot to reduce the blockage of mucus in your nose. After that, you will feel better. Green tea enhances the immunity. If you add some honey, the mixture will soothe your sore throat. Taking vegetable juice is an effective method to provide a lot of essential nutrients that fight against colds. Whether or not you get sick, supplying the body with the adequacy of protein is very important because it enhances your strengthen. When you suffer from the sickness, the stomach cannot digest the beefsteak and you become not energetic enough to cook well. In this case, you should choose the high-in protein or little-processed foods such as egg and yogurt. Although vitamin C is unable to shorten the time of illness, citrus fruits are good for your health. The white pulp of oranges, grapefruits, lemons and flavonoids included in key limes support to boost the immune system. It has been proved that glutathione is powerful enough to resist infections. Glutathione is found in watermelon and cruciferous vegetables such as broccoli, collard, kale and greens. Stewed water such as miso soup, chicken broth or vegetable broth and the first water of beef will provide enough water. Besides, they are all digestible foods that should be considered in case you have not desire for food. On the other hand, if you feel hungry, types of soup containing sliced vegetables, whole grain cereals such as barley and lean meat will give more vitamins and nutrients to your body. Soup and hot broth can work to warm the body, dispel the feeling of being cold and clear the cavity to reduce the nasal congestion. These vitamins are effective in healing the body. Therefore, you are advised to eat fish, soy milk, spinach, nutritious yeast, and cereals and potatoes when you fall sick due to weather changes. According to many researchers, the beneficial bacteria from yogurt can shorten the duration of getting a cold and having the flu. It is advisable to choose the yogurt containing strains of bacteria such as Lactobacillus reuteri or Lactobacillus casei. The reason is that these two strains are associated with the improvement in immune response. Yogurt made from fresh milk is a good option because it gives you about 10 grams of protein for each ration. When you are covered with a lot of sweat, vomit and have diarrhea, your body loses a great amount of potassium. Therefore, it is necessary to supplement the body with potassium. In particular, eating bananas is a good suggestion for making up for the lost amount of potassium for your body as soon as possible. In addition, eating bananas also help lower body temperature. In fact, high fever can endanger your life. Orange, tangerine, lemon and grapefruit are the citrus fruits that are rich in vitamin C. They have the effect of reducing the symptoms of the common cold. In addition, eating these fruits promotes the recovery of the body. Besides drinking and eating, other daily habits also have a great contribution to stopping being sick. 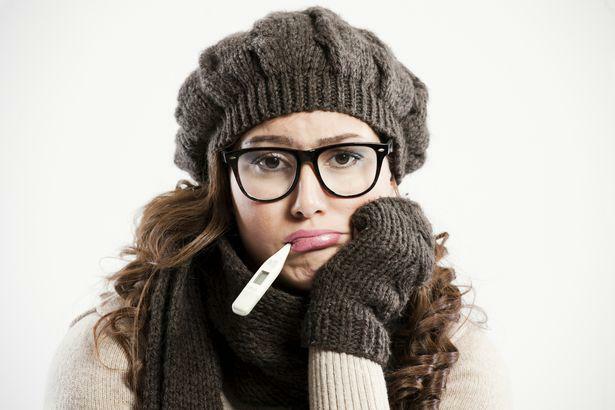 When you have a cold, your body needs more water than usual, especially filtered water and other kinds of herbal tea. Water helps to clear the throat, reduces throat dryness and sore throat and contributes to treating nasal congestion. Furthermore, when you provide plenty of water for the body, the body temperature will quickly balance and your high fever will no longer prolong. Water also purifies the toxins and get rid of bacteria. If you have a cold, keep in mind that you stay away from the drinks containing alcohol or caffeine because taking these things, you become more stressed and strained. It is more than likely that they cause fever. This is a folk remedy that has been handed down for a long time because of its effectiveness. The steam from the warm water and the hot bath will stimulate the body to promote the blood circulation, relax gently and make the sweat glands act more strongly. When your body produces much sweat, you will rapidly escape from the cold. As a matter of fact, this is also a good way for the body to remove bacteria and toxins. When you catch a cold, it is best to put on a long sleepwear and roll yourself up in a warm and soft blanket on a chair or bed. You can also drink tea or other warm drinks to keep the body warm and soothe your sore throat. Sleeping is a simple way to increase your body’s ability to heal the illness. You need to take a rest for 8 to 9 hours when you are being sick. For this reason, you spend enough time on sleeping at night. Besides, you should have one or two short sleeps in the daytime. Playing sports is usually strongly encouraged. But while dealing with colds, you should allow your body to relax for 3 to 4 days. It is aimed at making the body more comfortable. Taking only 3 to 4 days off will not affect your practice. If you still try to practice in these days, the cold may last two weeks. In conclusion, common illness does not threaten your life or cause serious results. Nevertheless, it brings you physical fatigue. The article above gives you some tips on how to stop being sick. If you follow these tips, especially the balanced diet, you certainly will recover from the sickness for the shortest period of time. How Can I Cope With My Anxiety Better?